Photograph of the Tomb of Muhammad Ghaus at Gwalior in Madhya Pradesh, taken by Bourne and Shepherd in c.1883, from the Archaeological Survey of India Collections. Muhammad Ghaus was a celebrated Muslim saint who died in 1563. His tomb dates from c.1565 and is a fine example of early Mughal architecture from the reign of Emperor Akbar (r.1556-1605). It is situated near the great hill fortress of Gwalior, held by the Mughals between the 16th and 18th centuries. The tomb is a square stone building with a large central dome originally covered in brilliant blue tiles, and hexagonal corner towers crowned by chhatris. The building is enclosed by perforated stone screens which form an exterior wall around the verandah surrounding the tomb’s central chamber. 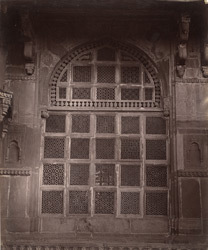 This is a view of one of the stone lattice screens, showing the delicately carved designs.